The training this past year has been great and the addition of Text Messages have been great features. I am continuously looking for ways to refine our services to make them clearer and simpler. Here are some of the focus areas for 2015. We will be taking a break from the Mid-Week Training and The How to Make Money Trading Stocks through the end of the year and will start back up the first full week in 2015. General Market Observation: Our three tracking indexes moved higher on Friday from their rebound on December 17th. This most recent move has all three in the extended and overbought condition, but from a Santa Claus rally standpoint moving up between 5% & 7% depending on indexes qualifies for a good Santa Claus rally. Now what? A continued upward bias through Wednesday’s regular close would not be surprising. There could be some volatile action as institutions balance their portfolios for the final quarter of 2014. Other than that, the trend is up with two of the indexes breaking to new highs last week. SPX: Broke to a new record high last Friday. Price action is just a stone throw away from 2100 which could represent whole number resistance. The 2080 level now reverses roles and becomes a level of support. 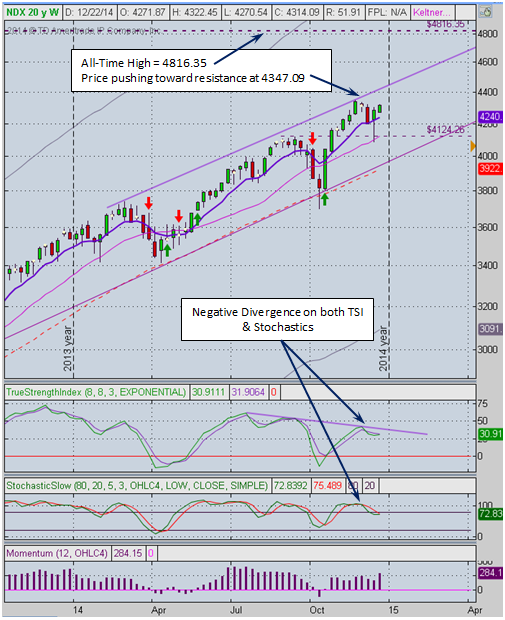 The weekly and daily charts are showing some negative divergence on the TSI and Stochastics but we’ve read this book before over the last 3 years. I’ll be watching the candlestick patterns on both timeframe going forward looking for continuation set ups or downside set ups. Right now we wait. NDX: The story is similar for the Nasdaq 100 with the exception of making new high. From a positive side it looks like a bullish 8-20 moving average cross may be shaping up which could provide a foundation for further movement up. But prices are at a resistance zone with negative divergence on several of the indicators as shown on this weekly chart. Some of the possibilities are move higher and put in a double top like formation or move above this highs from November 28th and continue progress towards the all-time Nasdaq high of 4816.35 from almost 15 years ago! RUT: The Russell made the best move of the week finally breaking above its yearly high and now into to free space. This represents a new All-Time high for this index and reflects a very positive reaction to the Fed meeting 2 weeks ago. The pledge by the Fed to continue holding interest rates low in to 2015 was welcomed by the small caps which like a low interest rate environment. This first venture above the resistance zone that served as the upper ceiling this year will be interesting to observe because the move came with the same negative divergences seen on the other two indexes. Remember that negative divergence does not mean price are going to begin falling immediately. It simply means that the current move is taking place on weaker internals and is more susceptible to correction or pullback—but that negative price action may be a sometime after the beginning of the new year. We are totally flat the market. The TSLA demonstration trade was closed on Friday. Outs & Ins: With only one more IBD 50 to add to this year’s Running List we will reset the Running list with the IBD 50 that comes out on January 2nd. To date the running list has grown to 217 stocks. This is a bit above the normal number of stocks for the year and reflects the ups and downs and uncertainty that has been present in the market throughout the year. I also will complete my annual study of the first IBD 50 from the beginning of 2014. This study is almost complete and just need the finishing prices for 2014. The preliminary results of the study are typical to what we’ve seen again and again since 2007. Growth stocks from the first IBD 50 of the year, again beat the socks off the S&P 500 benchmark! Beginning in 2015 we will also capture data on the IBD Sector Leaders to see how this list fairs for the year. 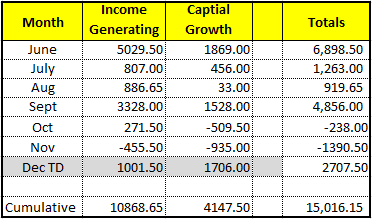 Because this is a smaller list we will try to capture additional data as stocks come off and are added to this list. For this week, the swap out of stocks was small with no stocks debuting on the IBD 50 list. Off the Wall: “We must all suffer from one of two pains: the pain of discipline or the pain of regret. The difference is discipline weighs ounces while regret weighs tons.” This Jim Rohn quote is one of my favorites because it speaks to the heart of how our decisions influence and often cause our circumstances. When it comes to trading are we willing to go through the “Pain of Discipline” to become the great trader? Often folks are attracted to what appears to be easy about trading. Learn a little bit about stocks and options and then start raking in the profits. Well guess what, it doesn’t work that way. Like any other endeavor becoming a master trader requires discipline, perseverance and a great system. Many start on the road to trading success but few finish the journey. I would suppose that the pain of regret in trading is due to the lack of discipline. Discipline is mastered a little at a time—just like any other important challenges in life. If you do become a disciplined master trader you will have finished the journey successfully and accomplished much more than just learning how to trade! You will have the discipline to face anything that life may throw at you!